The European Commission and the IMF have cut short informal aid talks with Hungary due to worries over the independence of its central bank. Hungary had been seeking a standby credit line of 15-20bn euros ($19.5bn, £12.6bn) in case it ran into trouble issuing new debt. In November its credit rating was downgraded to 'junk' status by Moody's. EU negotiators objected to a proposed law which they said would compromise the independence of the central bank. "Unfortunately we did not receive assurances concerning the intentions of the Hungarian government, (which went on) to push forward in parliament the vote on the law that could potentially undermine the independence of the central bank," said European Commission spokesman Amadeu Altafaj. Bank governor Andras Simor has said the proposed bill amounts to a takeover of the central bank. However, the Hungarian government and members of the country's ruling Fidesz party played down the disagreement. "Hungary owes the IMF significant amounts of money," said Fidesz parliamentary group leader Janos Lazar. "I have no doubt that they will return to collect what we owe them." 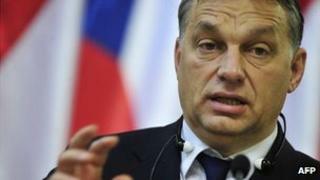 Hungary received a 20bn euro bailout from the fund following a banking crisis in 2008. Hungary has pursued an unorthodox economic policy since Prime Minister Viktor Orban's government was elected in April 2010. In a bid to tackle the deficit - and avoid further IMF loans - the government has transferred private pension assets to the state and put new taxes on its banks. However, the government, which has delayed recent attempts to raise money from the markets, is now seeking an IMF/EU funds guarantee. Formal talks between Hungary and the IMF and EU are supposed to begin in January.